Can only water fall in a waterfall? 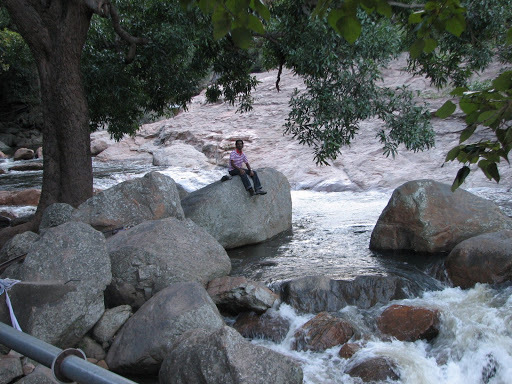 The next place in our trip was the “Monkey Falls” near pollachi. In fact it is just 3 KMs more from the Azhiyar dam that we visited the previous day. So we set out in the same bus that took us to Azhiyar, got down at Azhiyar dam itself and decided to walk the three KMs to see if we could end up in something interesting on the way. Just about a KM from Azhiyar, there was a small place off the road where we could hear the sound of water gushing out of something at high speed. So we jumped off the road and did a small trek over the hard rocks, spent some time out there and obviously clicked some snaps too!! After this incident my confidence with waters went really down and for the whole trip I was very hesitant towards stepping in to water, though most of the places we went were like falls, dams…After spending another hour there we decided to head straight to Tirumoorthy falls which we heard is another good falls around. 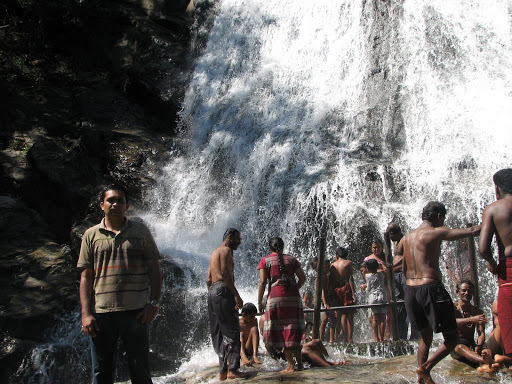 So we went back to Azhiyar, had food there in some local shop and inquired about going to Tirumoorthy falls. We were told to take a bus to a intermediate place from where if we could take a bus which would go to Udumalaipettai then we could reach Tirumoorthy falls. We did the same and reached the fallls at around 3.30 types. We wasted some time in waiting for buses. 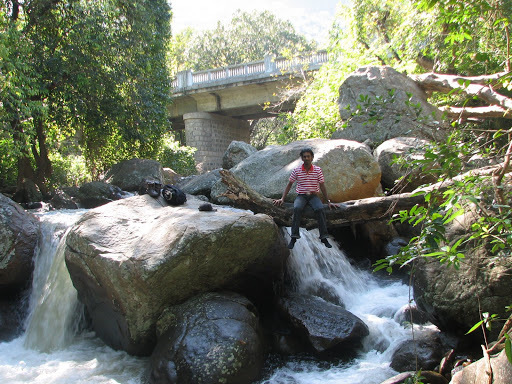 Only after reaching the falls we realized that we should have come to Tirumoorthy in the morning and could have easily spent the whole day there. Just as a falls, it is only about climbing say about a KM up and reaching the top spot where there is one Panchalinga temple. And probably you can take bath here too. There were lots of sabarimala saamis who were coming back after the darshan. On the way they come here, take bath and head straight to home.